If you want to enjoy a fun vacation in Branson without leaving your work, stay at some of the lake condos at Thousand Hills Golf Resort. The lake condo at Thousand Hills in Branson is a perfect place to spend a productive autumn vacation with the whole family while getting busy online with your work. With the beautiful location of the lake condos in Branson, you will find it convenient and comfortable if you want to set up a work station in your cozy condo accommodation. With wi-fi connection in every lake condo, you can always stay online anytime giving you the opportunity to continue your work remotely. Beautifully located in the heart of Branson where live entertainment shows, exciting attractions, and shopping are easily accessible, lake condo is such a great place to spend a wonderful autumn workcation especially when your work that you left behind can be done remotely. Each of the lake condo features a fully furnished kitchen with modern appliances such as fridge, microwave oven, washer/dryer, dishwashers, pots and pans, and other kitchen wares and utensils. With all these, it will be convenient for you to prepare a snack whenever you become hungry after long hours of working online. These cozy lake condos in Branson are conveniently located along the north of Table Rock Dam and near the Moonshine Beach, State Park Marina, and the popular Corps of Engineers Park. These condos are beautifully constructed with the most modern design and architecture. The living area of each lake condo features a sofa sleeper giving a comfortable stay for extra guest. The bedroom in each condo is completely furnished with top quality mattresses and triple sheeting that will make you sleep soundly the whole night. Spending a wonderful autumn workcation at the condos gives you the chance to see spectacular landscape with changing colors of autumn leaves from green into vibrant red and eventually fall to the ground. 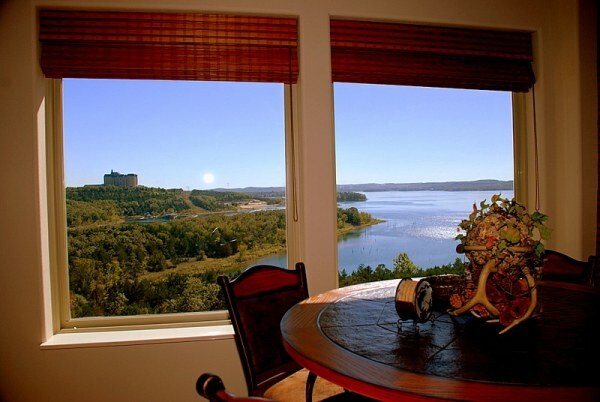 The great location of lake condos in Branson gives you easy accessibility to many exciting attractions, great outdoors, and fun activities in the pristine waters of Table Rock Lake. With the beautiful location of the condos near the lake, you can always get easy access to the water if you intend to go fishing, swimming, or take a boating adventure. After enjoying great water adventures such as fishing or boating, you can dock your boat overnight at the State Park Marina near your condo accommodation. Even if you work online while having a wonderful autumn workcation in Branson, you wouldn’t want to miss shopping and dining. You can enjoy all these during your wonderful autumn workcation in Branson, as the shopping and fine dining spots are just minutes away from your accommodation. In Branson Landing, you will find many retail shops and fine restaurants that can help make your vacation in Branson a memorable one. So, if you want to have a relaxing autumn workcation in Branson, stay at the lake condo at Thousand Hills Golf Resort.